This article is by James Archer, telecommunications blogger, automation & IT systems technician and member of the Australian FTTP Action Group. It first appeared on Archer’s blog and is replicated here with permission. opinion What is democracy? Hundreds of thousands of lives have died for it. Entire wars fought over it. Statesmen in funny wigs have had clandestine meetings in secret to work towards it. But what does it mean to live in a democracy? 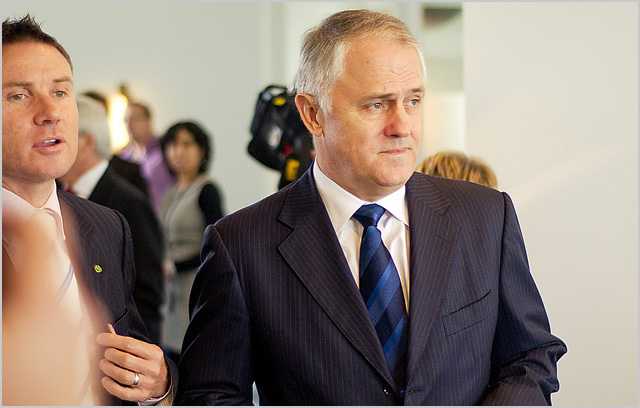 I won’t bore anyone with definitions that you’ve probably already read (Kieran Cummings aka @Sortius already dissects it very well in his latest blog post) But suffice to say there seems to be a disagreement brewing between newly appointed Communications Minister, Malcolm Turnbull and the online community. @PhillipTyson wasn’t there an election recently at which nbn policy was a key issue? Now, I don’t know about you, but clearly Mr Turnbull has said there he believes the election result has, without question, determined the direction of the NBN under a new government. Strange considering the NBN was not part of the Coalition’s oft-repeated multi-point plan during the election, much publicised on TV and on pamphlets. In fact, the only well-publicised (unless you count 11pm on Lateline) talk about the NBN under the Coalition … was from Labor. And the resulting rebuttals from Turnbull which usually made it in on page 17 somewhere of the Telegraph or The Australian. Again, Mr Turnbull appears to be suggesting a Coalition win, without question, determines the direction of the NBN. What many people may not realise is, the NBN does not require legislation to pass to radically alter its direction. Unlike Direct Action or Stop the Boats, this Coalition plan, to change Labor’s 93 percent rollout of Fibre to the Premises, to 22% FTTP and 71% Fibre to the Node, requires only the sign-off of NBN Co’s shareholder ministers — Communications Minister Malcolm Turnbull and Finance Minister Mathias Cormann. That’s it. No legislation (that’s to come later – paywalled). No parliamentary debate. It is, essentially, a dictatorship for the NBN. Something ex-Comms Minister Stephen Conroy relished. Mr Turnbull has a history of personal attacks on the NBN, from NBN Co former (still-serving) CEO Mike Quigley, twice no less, to the NBN Co board in general and even the new chairwoman Siobhan McKenna. It seems Mr Turnbull doesn’t play by the rules of ‘play the ball, not the man’. Recently, many groups online have sprung up to try and make Australians aware of the importance of FTTP to Australia’s digital future. A dozen Facebook pages, a dozen Twitter Avatars and dozens of individual web pages and web sites dedicated to trying to allow the public of Australia to understand that while Labor’s NBN was far from perfect, its underlying majority technology, FTTP, was essential for growth and innovation in Australia. Much of the public sees the distinguishing factor between FTTP and FTTN as simply speed — FTTN is capable of around 100Mbps, depending on where you live, while FTTP is capable of 1000Mbps in its current form, as being rolled out by NBN Co. Reliability: Fibre has only one major weakness; physical damage. It and its architecture is impervious to water & RF interference. And poor joints are easily determined within a few metres via optical testing techniques. Ubiquitous speeds: NBN Co’s FTTP network has a range of 14km from the fibre version of an Exchange (FAN) in which no matter which speed tier you order, at a wholesale level, you receive that speed. Of course, your RSP may throttle or contend the link. But this is the same between FTTN and FTTP. The point is FTTP has little physical limit like copper for speeds and distance. Certainly not in that 14km. Maintenance: Fibre in FTTP is between 2 and 5 times cheaper to maintain than copper. Verizon in the US, with its branded FiOS FTTP system, sees the company willingly upgrading people to fibre upon failure of their copper telephone line. The primary citation given for doing this is the failure rate of fibre: 2 to 3 times less than copper. That’s a big saving when you’re looking after millions upon millions of copper lines. In fact, after Hurricane Sandy several years ago, Verizon chose to dump its copper network and replace the damage done with fibre. Several numbers have been bandied around from Verizon, $35/year/line for FTTP and $128/year/line for copper. But references for these are hard to find, being commercially sensitive industry information. All this and you get a major boost in speeds available too. Now, Mr Turnbull knows all this — he’s talked to dozens of telecom experts around the world during his time in Opposition. But they have apparently told him FTTN is an excellent and well performing technology. What he doesn’t say is … all these experts are either incumbents and own the copper network or have already substantially, or completely, finished their FTTN networks (such as Germany or the UK). While Australia, under the new government, would not even start until late 2014/early 2015. There seems to be a major gap of information here not being talked about. What myself and many others like me would like to see is Mr Turnbull’s reviews. We want to see them happen in an open and publicly transparent manner. We want to see engagement with the online community, the telecom industry and experts in the field. Not behaviour such as we’ve seen (above) from Mr Turnbull in simply ignoring calls to be truly technologically agnostic. After all, if he was … why would he insist on giving a percentage coverage for FTTN? Would it not be prudent to wait for these reviews, as he chastised Labor for not doing originally on the NBN? Our group, Mr Turnbull, wants to see you provide the best telecommunications infrastructure for this country to grow and evolve our services. We are apolitical — this is not about Labor or Liberal. This is about the best system that Australia needs not only now, but for decades to come. James Archer is a member of the Australian FTTP Action Group, which includes groups such as Save the NBN and weneedthenbn.com, the author of the Change.org petition Nick Paine, former Telstra technician Kieran Cummings, telecoms and technology blogger Steve Jenkins and has support from several experts including Paul Budde and from ISP iiNet. Much appreciated. We want and need open lines of communication. Not constant divisive, particularly politically based, arguments. I and many others are waiting & hoping for these reviews to begin quickly, transparently and publicly. Turnbull has almost certainly made up his mind – the LNP have invested too much capital in changing the NBN’s direction to admit defeat now. What I’d like to see is pressure on MT to commit to releasing the full findings when they come out. I expect they will be buried under some FoI legislation, and prove very stubborn to extraction. Get him on record as being willing to release it, and hold him to it. That way, if it DOES point to FttH/P as the better option, he cant bury it and deny it happened. It will not do that because the terms of reference will be set such that it cannot. Expect terms of reference to ignore TCO and refer only to cost of build for one thing. Thats the flipside. We get to see the terms and debate those as well. Shown, it gets to be picked apart and analysed word for word, as it should. If its the document he expects it to be, it shouldnt be hard for him to agree to showing it un-redacted, and bared for all to see. Point being that if we can see it, we can debate it. One would also expect that if it’s debatable, it’s changeable, otherwise the entire process is just a sham. I also expect it to avoid any social benefits as well. I’m still not sure what you people are trying to achieve. Remember the Iraq war protests? You can speak of democracy all you like but the politicians you are trying to reason with have no respect for that. Clearly a dictatorship is preferable to diplomacy and compromising with others. Turnbull and the coalition clowns made up their mind years ago. Now the people that were fooled by him are going to get exactly what they want and voted for in the next 1198 days. Sure we know the correct direction the NBN should go but as it stands I dont see a problem with this. It’s a shame you feel that way Hubert. I think there’s excellent progress to be made from keeping public pressure on Turnbull & the new government. Sure, they could ignore everyone & go their own way anyway. It’s always possible….but you don’t think we’d be here at election time then discouraging voting for them based on their complete disregard for public opinion? It is in governments best interest to work with industry and public groups. Then it can head off future criticism that parties weren’t aware of the stakes. @seven_tech: I would love be as optimistic as you. But history from politics from both sides of the divide have show no matter how unpopular a decision is once the government elect has set it as a “mandate”. It’s very hard to shift them away from such plans. The politician’s mind can only be change by ONE and ONE thing only – election time. Anything that happens in between those 3 years is practically set in stone. The Coalition’s loss of an “un-loseable” election to Gilliard was a huge impetus to create a plausible NBN policy as opposed to the original NBN = BAD! stance they took. Well I’m all for keeping the pressure on Turnbull and the rest of his zoo crew chums but I’d much rather this pressure be applied to what they intend to roll out rather than what could have been rolled out. If he fudges everything and still stands by his plan, and it goes to hell in a hand-basket oce actually built, his days in politics will pretty well be over. In this case aren’t they pretty much the same thing though? Its a bit hard to disassociate Labor from the NBN when its already in place, and we are applying pressure to what the coalition intend to roll out. I guess that’s part of the problem – things would have to get very dire indeed with Telstra and FTTN, for the coalition to change course to FTTP – because in doing so they would be indirectly admitting “Labor were right” (the thought of Turnbull or Abbott conceding they were wrong about anything is unimaginable). I honestly believe Malcolm knows full well that a ubiquitous FTTP network would offer the greatest social and long-term economic benefits to Australia. However he doesn’t seem to care about the long-term (not helped by the fact he has a technology-illiterate monkey as his superior) and he now has to stick to his cheapskate “technology agnostic” approach. Like any good conservative he’s deliberately slowing the rate of long-term progress for short-term gains. It actually makes sense to roll-out FTTP and FTTN (in more limited areas) where FTTP might take a long time, or have ‘issues’. It also makes sense to use FTTB in things like MDU’s unless the Body Corp is in favour and on board FTTP. It basically comes down to Malcolm recognising that FTTP should be more the base of his plan than FTTN, but also that FTTN/B has a place in it as well. I agree. Very interesting reading. In an ideal world we’d obviously all prefer FTTP, but the plan Michael has outlined there is rational, and a massive improvement over the coalition’s current policy, that’s for sure. Thanks for the link. You mean the way we were here at election time discouraging voting for him based on their complete disregard for public opinion? We had little argument he was ignoring the public then. We will now. I disagree in that I thing the decision was made around 5 months before the election along these lines: FTTP NBN = Labor, Labor = Bad therefore FTTP NBN = Bad and must die! ¨We are apolitical — this is not about Labor or Liberal.¨, I think it is more that you wish it was that and Turnbull is very emphatically telling you that it is the opposite. You haven´t even agreed on what you are arguing about. Its not a hard concept. There is no argument in this regard. FTTP is the the better tech than FTTN. For the reasons stated in the above article. Did you even read it or did you just choose to naysay automatically. How about you actually engage in discourse rather than automatic retaliation. Why are you so emphatic about supporting FTTN? Its no longer political, the election is won. For me it was never political. It just happened that the Labor plan was the best technology. At the best bang for buck. Where did I give any support, emphatic or otherwise, for either choice? It is clear that Murdock has instructed the Coalition to destroy the FttH NBN. The NBN threatens Murdock’s business model, and Big Business wants to privatise and monetise the Internet. If this is true, then it will take enormous pressure to get Abbot and Turnbull to reverse direction. I think the only hope is to push Turnbull into digging a big and bigger hole until it engulfs him. Kind of. It’s as much about holding him to account and making him stand by things as it is getting him to realise there is a better way (and that ‘better way’ isn’t necessarily full FTTP). But until the study/inquiry/CBA are finished, there isn’t much anyone can do really. Malcolm actually needs those to be completed before he can continue forward. The government has already backed down on paying back the debt and most who voted for it probably don’t even realise the debt reduction schedule for Labor and LNP is now almost the same. So much for the precious mandate. The only thing politicians fear is loss of seat or office. Tony Abbott has shown how you get into office with inferior policies by merciless repetition of a government’s faults, real or imagined. One has to fight fire with fire and repeat the complaint past the point where you can bear to hear it any more. I’m concerned MT will start backtracking on his deliverables with sufficient time before the next election to slide into a second term unless the opportunity is taken to remind folk of the deliverables at every turn. No Excuses. MT knows there is a better way it’s just that more people need to learn of that way. Interesting that no one I the media that I have seen has put forward the worst case I can think of: house of reps only put forward supply bills for the coalition plans, Senate refuses to pass these supply bills. End result, no money for any broadband upgrades of any kind. Could happen, coalition looks very unlikely to control the Senate or really even be close to it. No, that has been mentioned widely in the media well before the election. There was major speculation that it could be part of an Abbott plan since he knew he would not get control of the Senate. People speculated that Abbott would use the Carbon Tax, and Labor´s ability to block removing it in the Senate, to trigger a double dissolution election, which he expected to win and give him control of both Houses. It was only speculation that he had such a plan, but it would lessen his ability to sell the necessity of a double dissolution election if he was seen to be making concessions on other Labor Policy such as NBN. I don’t follow the logic there, but politics has always seemed a bit upside down to me. What can get through without senate support? Nothing that invloves paying money, I’m fairly sure of that much. How much can Abbott undo without senate support? How much can go ahead without House of Reps support? Do existing contracts between NBNco stay in place and keep getting paid? The NBN is not beholden to either House. There is a Senate NBN rollout working committee. But the funding for the NBN is directly controlled by the government. To stop the NBN funding, you’d have to block the Budget. The NBN is at the discretion of the Shareholder ministers EXCEPT if it is to be sold, in which case Lower House approval is needed. I’m not sure he is so keen on the idea after the number of non-Liberal senators that got in to the senate. I doubt he’ll pull the trigger on a DD without changing some rules first. What more can I say than Fibre to the Home James and don’t spare the nodes.